Although honey can be found in virtually all countries in the world, the conditions in Australia are ideal for the creation of high quality and unique honey. Then there is Manuka honey. Many people believe this is only available from New Zealand, but it’s actually widely produced in Australia as well. 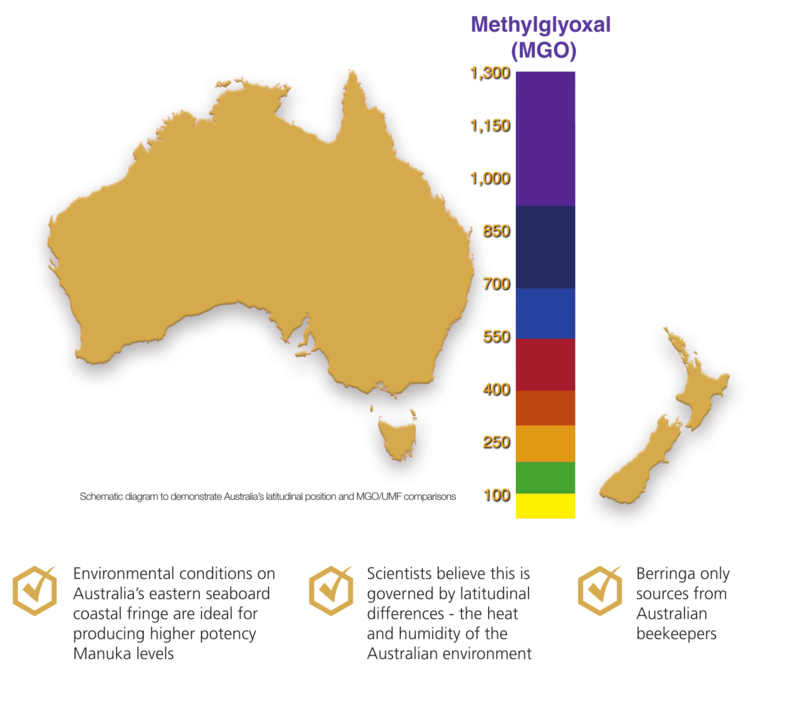 In fact, Australia’s warmer climate provide very favourable conditions for growing Manuka plants (and we have 83 species) that produce honey with high amounts of methylglyoxal (MGO) from their unique nectar and pollen, as acknowledged by world experts in honey production. Scientists believe this is governed by the heat and humidity of the Australian environment, stemming from the latitude difference between Australia and New Zealand. Berringa Australian Manuka Honey is harvested by beekeepers in pristine coastal forests and bushland in Australia, in Queensland and New South Wales. Areas that are wild and which typically experience harsh weather conditions. These conditions are ideal for the production of Manuka Honey with exceptionally high levels of antibacterial activity, as measured by MGO. Berringa’s range even includes Berringa Super Manuka MGO900+, which contains some of the highest MGO levels in the world.